The walkie-talkie TYT MD-390 is a conventional FM (analog) and a digital DMR radio compatible Tier 1 & 2 (with Motorbro Motorola and Hytera), Waterproof (IP67), 2200mAh battery, with new vocoder available either in VHF from 136 to 174Mhz (5W) or in UHF band from 400 to 480 MHz (5W), with optional GPS (on UHF handheld only). 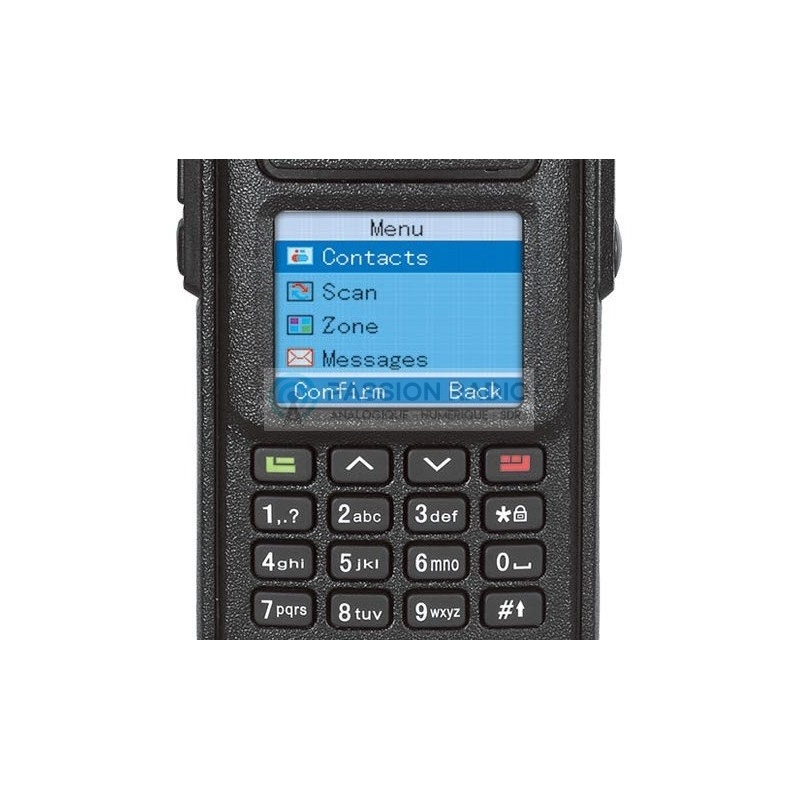 The TYT MD-390 features a large LCD backlit display, keypad, voice recorder up to 8 hours, 1000 channels, CTCSS, DTMF, and update firmware functions. Comes complete with: 1 TYT MD-390 DMR UHF, 1 desktop charger 120V-240V (EU plug), 1 battery (Li-ion 7.2V 2200mAh), 1 antenna 12cm and 1 antenna 36cm, 1 clip fixing belt, manual + USB programming cable Tytera included. The TYT MD-390 uses a standard connector Kenwood 2-pin (K1) for headset (available in option). The antenna connector on the handheld is SMA female. New dual-band model: TYT MD-2017 VHF and UHF, FM and DMR, with optional GPS. Description: The walkie-talkie TYT MD-390 is a conventional FM (analog) and a digital DMR radio compatible Tier 1 & 2 (with Motorbro Motorola and Hytera), Waterproof (IP67) , 2200mAh battery, with new vocoder available either in VHF from 136 to 174Mhz (5W) or in UHF band from 400 to 480 MHz (5W), with optional GPS (on UHF handheld only). The TYT MD-390 features a large LCD backlit display, keypad, voice recorder up to 8 hours, 1000 channels, CTCSS, DTMF, and update firmware functions . Comes complete with: 1 TYT MD-390 DMR UHF, 1 desktop charger 120V-240V (EU plug), 1 battery (Li-ion 7.2V 2200mAh), 1 antenna 12cm and 1 antenna 36cm, 1 clip fixing belt, manual + USB programming cable Tytera included . The TYT MD-390 uses a standard connector Kenwood 2-pin (K1) for headset (available in option). The antenna connector on the handheld is SMA female. New dual-band model: TYT MD-2017 VHF and UHF, FM and DMR, with optional GPS.